"Will you help me rescue my friends?" 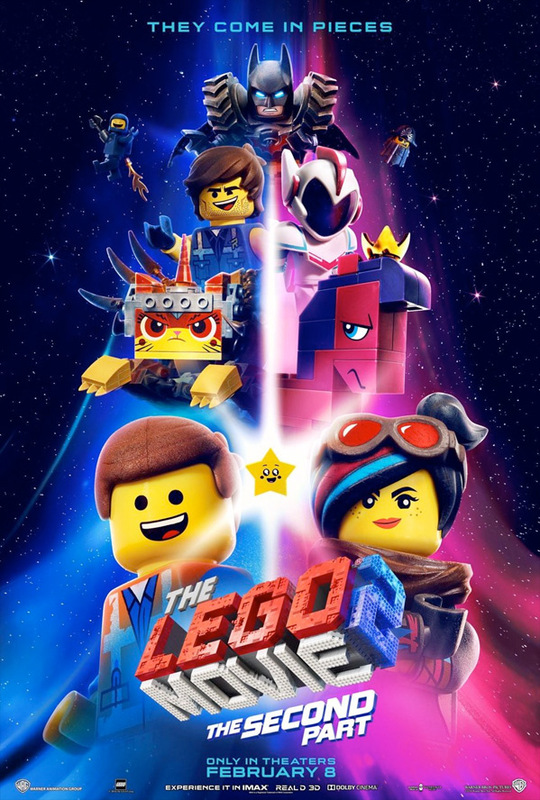 Warner Bros has released the second official trailer for The Lego Movie 2: The Second Part, the sequel to the wildly successful and highly acclaimed original The Lego Movie released in 2014. This one isn't directed by Phil Lord & Chris Miller, but they did write the screenplay and they did produce it, so this is still very much their work. This time around, the citizens of Bricksburg must fight off Duplo invaders from outer space. The main voice cast includes Chris Pratt, Alison Brie, Stephanie Beatriz, Elizabeth Banks, Channing Tatum, Will Arnett, Nick Offerman, Jonah Hill, and Tiffany Haddish. WB already made two other Lego "spin-off" movies about Batman and Ninjago in the meantime, but they're bringing it back to the original story about Emmet Brickowski and Wyldstyle. The first teaser was great, this trailer is even better. I'm already totally sold on this, thankfully not long of a wait. You can still watch the first trailer for The Lego Movie 2: The Second Part here, to see the original teaser. It’s been five years since everything was awesome and the citizens are facing a huge new threat: Lego Duplo invaders from outer space, wrecking everything faster than they can rebuild. The battle to defeat them and restore harmony to the Lego universe will take Emmet, Lucy, Batman and their friends to faraway, unexplored worlds, including a strange galaxy where everything is a musical. It will test their courage, creativity and Master Building skills, and reveal just how special they really are. The Lego Movie 2: The Second Part Trailer is co-directed by filmmakers Mike Mitchell (director of Deuce Bigalow: Male Gigolo, Surviving Christmas, Sky High, Shrek Forever After, Alvin and the Chipmunks: Chipwrecked, and Trolls) and Trisha Gum (an art department coordinator now making her feature directorial debut). The screenplay is written by Matt Fogel, Phil Lord & Chris Miller. Warner Bros will release The Lego Movie 2 in theaters everywhere starting on February 8th, 2019 early next year. Still looking good? Ready to see this?